"Ilya Ivanov" redirects here. For the Russian footballer, see Ilya Yuryevich Ivanov. 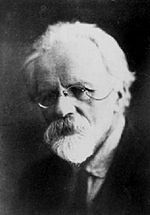 Ilya Ivanovich Ivanov (Russian: Илья́ Ива́нович Ивано́в, August 1 [O.S. July 20] 1870 – March 20, 1932) was a Russian and Soviet biologist who specialized in the field of artificial insemination and the interspecific hybridization of animals. He is famous for inseminating three female chimpanzees with human sperm (with no result) as a part of his controversial attempts to create a human-ape hybrid. Ilya Ivanovich Ivanov was born in the town of Shchigry, Kursk gubernia, Russia. He graduated from the Kharkov University in 1896 and became a full professor in 1907. He worked as a researcher in the Askania-Nova natural reserve, also for the State Experimental Veterinary Institute (1917–1921, 1924–1930), for the Central Experimental Station for Researching Reproduction of for the Moscow Higher Zootechnic Institute (1928–1930). Around the start of the 20th century, Ilya Ivanov perfected artificial insemination and its practical usage for horse breeding. He proved that this technology allows one stallion to fertilize up to 500 mares (instead of 20–30 by natural fertilization). The results were sensational for their time, and Ivanov's station was frequented by horse breeders from many parts of the world. In the course of a general political shakeup in the Soviet scientific world, Ivanov and a number of scientists involved in primate research and experiments lost their positions. In the spring of 1930, Ivanov came under political criticism at his veterinary institute. Finally, on December 13, 1930, Ivanov was arrested. He was sentenced to five years of exile to Alma Ata, where he worked for the Kazakh Veterinary-Zoologist Institute until his death from a stroke on 20 March 1932. The renowned physiologist and psychologist Ivan Pavlov wrote an obituary for him. The most controversial of Ivanov's studies was his attempt to create a human-ape hybrid. As early as 1910, he had given a presentation to the World Congress of Zoologists in Graz in which he described the possibility of obtaining such a hybrid through artificial insemination. In the 1920s, Ivanov carried out a series of experiments to create a human/nonhuman ape hybrid. Three female chimpanzees were inseminated with human sperm, he failed to create a pregnancy. In 1929 he organized a set of experiments involving nonhuman ape sperm and human volunteers, but was delayed by the death of his last orangutan..
His work was one of the sources of inspiration for the unfinished satirical opera, Orango whose Prologue was sketched in 1932 by Dmitri Shostakovich with a libretto by Aleksey Nikolayevich Tolstoy and Alexander Osipovich Starchakov but the whole was later abandoned and discarded. The manuscript was found by Olga Digonskaya, a Russian musicologist, in the Glinka Museum, Moscow in 2004 and orchestrated by Gerard McBurney; this work was premiered on 2 December 2011 in Los Angeles, California by the Los Angeles Philharmonic under Esa-Pekka Salonen (conductor) and staged by Peter Sellars (director). The first season, episode one, of the 2011 sci-fi and horror dramatized documentary television series, Dark Matters: Twisted But True, features a segment, titled "Ape-Man Army", in which the theories of Ivanov on human-ape hybridization are dramatized. ^ E. P. Fridman; D. M. Bowden (January 2009). "The Russian Primate Research Center – A Survivor". Laboratory Primate Newsletter, Volume 48, Number 1. Retrieved 22 May 2017. ^ Rossiianov, K (2002). "Beyond species: Il'ya Ivanov and his experiments on cross-breeding humans and anthropoid apes". Science in Context. 15 (2): 277–316. PMID 12467272. Rossiianov, Kirill (2003). "Beyond Species: Il'ya Ivanov and His Experiments on Cross-Breeding Humans with Anthropoid Apes". Science in Context. 15 (2). doi:10.1017/S0269889702000455. Zvereva, G. V (1970). "Professor I.I. Ivanov--founder of artificial insemination of animals". Veterinariia. 7: 88–90. PMID 4253169. Smirnov, L. N; Ozhin, F. V (1970). "Outstanding scientist-biologist (Il'ia Ivanovich Ivanov)". Veterinariia. 7: 90–2. PMID 4253171. Etkind, Alexander (2008). "Beyond eugenics: The forgotten scandal of hybridizing humans and apes". Studies in History and Philosophy of Science Part C: Studies in History and Philosophy of Biological and Biomedical Sciences. 39 (2): 205–210. doi:10.1016/j.shpsc.2008.03.004. PMID 18534351. This page was last edited on 12 December 2018, at 15:31 (UTC).